Last Monday, while the rest of us were fleeing the 100F+ heat at the beach and the movies, Cornelia Chef Dan Latham was out at the New York Botanical Garden to participate in their season-long Edible Garden series. 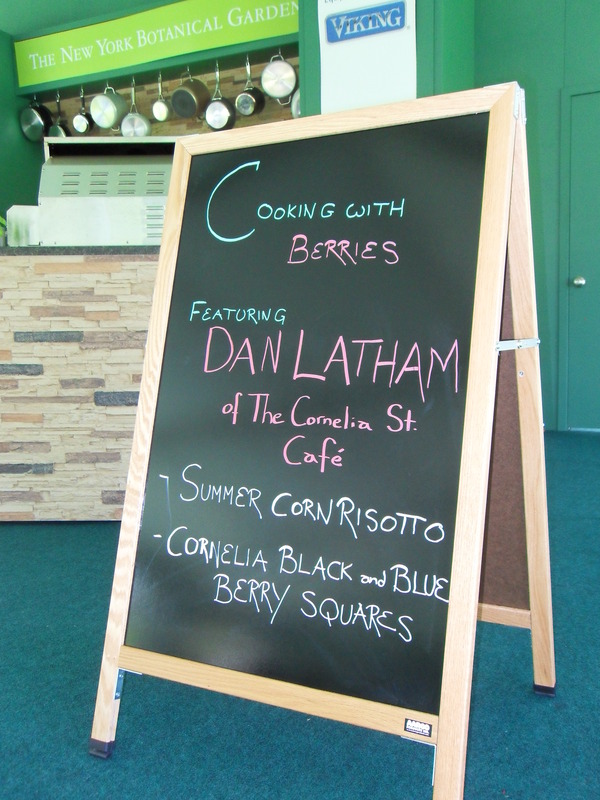 Amidst many and varied Bronx-bound species, Dan performed a live-action cooking demo in a sweet semi-covered kitchen, showcasing three recipes based around edible plants. His dishes: Summer Corn Risotto with Tomato Basil Coulis and Cornelia Black & Blue Berry Squares. More pix and his full recipes after the juuuump! You are currently browsing entries tagged with summer at Cornelia Street Café.